We’d like to announce that we have rolled out to everyone our new feature “Auto Pay”. This allows Buyers and freelancers to manage effectively work delivered on an ongoing basis. A Buyer and freelancers are working together with fixed deliverables and payments every week or month. 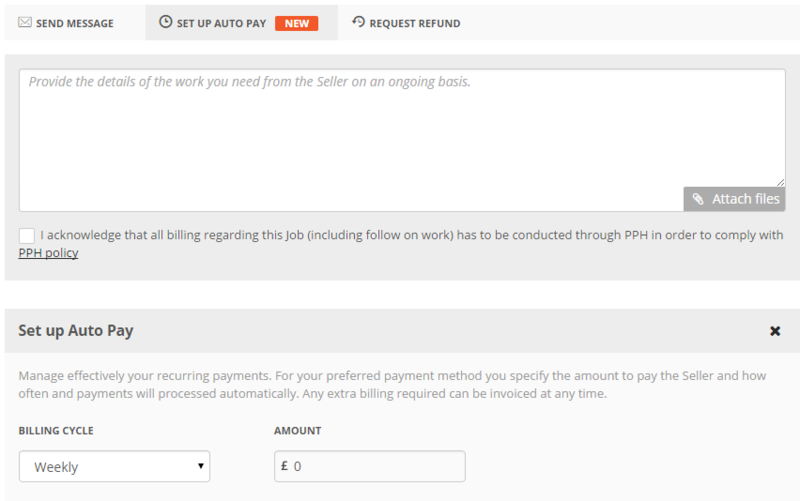 The buyer sets up the Auto Pay feature by specifying the deliverables, the billing cycle to “weekly” or monthly“ and the amount to pay the freelancer. You get one or more freelancers that you trust to work for you for a fixed price contract that you define. No need to get numerous invoices and remember to review and pay them one by one! Fewer conflicts and questions from freelancers as it gets clear what they have to do and how and when they will be getting paid. Just go to your WorkStream inbox, choose any WorkStream you have recurring billing with a freelancer, select “SET UP AUTOPAY” just above the messaging box, fill the details and that’s it! The freelancer will be notified and start working based on your requirements. You start working with a fixed price contract with Buyers that have ongoing needs. No need to remember to raise numerous invoices and check if the Buyers have paid them. Fewer conflicts and unnecessary communication to Buyers as it gets clear what they expect done and how and when they will be paying. Just go to your WorkStream Inbox, choose any WorkStream you have recurring billing with a Buyer, select “MORE” > “REQUEST AUTOPAY” just above the messaging box, fill the details and wait for Buyer to approve.